Metso global website News 2015 Metso provides an innovative energy efficient solution with the world's largest high-pressure grinding roll -The HRC(TM)3000 at Freeport-McMoRan's copper mine in Morenci, Arizona, the U.S.A.
Metso provides an innovative energy efficient solution with the world's largest high-pressure grinding roll -The HRC(TM)3000 at Freeport-McMoRan's copper mine in Morenci, Arizona, the U.S.A.
Energy efficiency is the key to success at modern mines and quarries. The most potential for energy and cost savings can be realized in the comminution process, where ore is ground and crushed into smaller particles. 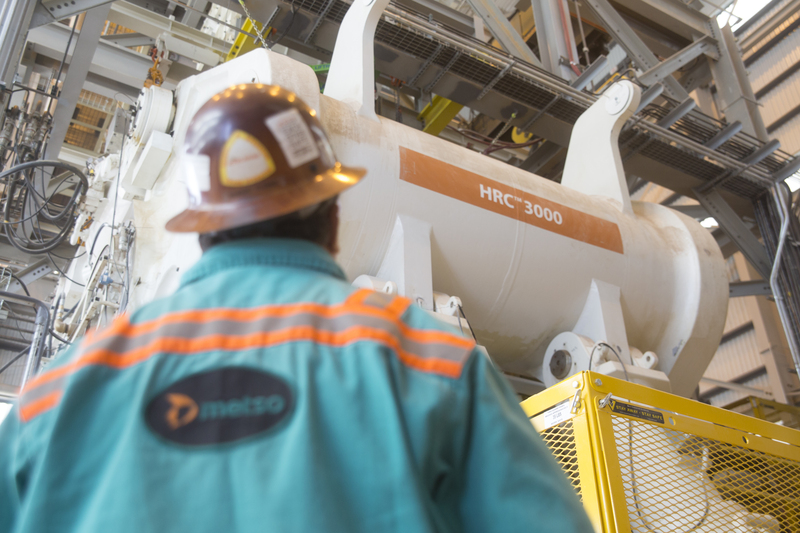 With the HRC(TM)3000, the largest fully operating high-pressure grinding roll (HPGR) in the world, Metso provides an energy efficient solution with an impressive range of industry-leading features, aimed at getting more value from every ton of ore. 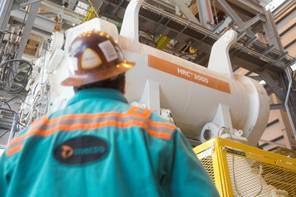 The HRC(TM)3000 was the result of a close collaboration between Metso and Freeport-McMoRan Inc. The goal was to develop a highly efficient HPGR crushing circuit for the newly constructed Metcalf concentrator at Freeport-McMoRan's copper mine in Morenci, Arizona. In approximately 4 years, the team went from a design concept to the largest fully operating HPGR in the world. The HRC(TM) 3000 started operating at Freeport-McMoRan's copper mine in May 2014. The installed unit is the largest of its kind in the world, allowing for fewer lines of equipment which reduces the amount of ancillary equipment. 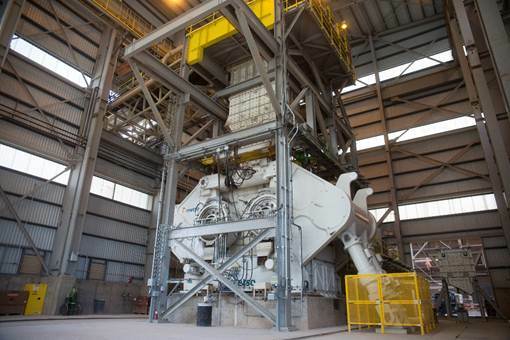 To date, the unit has operated for over 8,400 hours and has crushed more than 34 million tons of porphyry copper ore. Metso's solution has provided the Morenci mine with several benefits, including an estimated 13.5% increase in energy efficiency over traditional HPGRs based on pilot scale testing. The HRC(TM)3000 is the first full scale HPGR to incorporate revolutionary design features like the flanged tire design and the patented Arch-frame. Depending on the application, the total capacity of this HPGR can exceed over 5,400 tph of ore.
"In addition to boosting the equipment's energy efficiency, our main goal was to innovate and to push the existing boundaries in order to ensure a valuable solution to our customer. This HPGR is not only a larger scale version of what was currently available to the market, but also applies technological solutions to overcome some inherent concerns typically associated with traditional HPGRs, including skewing and edge effect, " says Victoria Herman, Product Manager, HRC(TM) High Pressure Grinding Rolls. The sixth international conference on Semi-Autogenous and High Pressure Grinding Technology (SAG) to be held in Vancouver, British Columbia, Canada, from September 20-24, 2015, offers a special opportunity to learn more about the development of the HRC(TM) 3000 from Metso experts. Metso is the world's leading industrial company in the mining and aggregates industries and in the flow control business. Our knowledge, people and solutions help drive sustainable improvements in performance and profitability in our customers' businesses. Metso has an uncompromising attitude towards safety. Our products range from mining and construction equipment and systems to industrial valves and controls. Our solutions are delivered and supported by decades of process knowledge and a broad scope of services backed by a global footprint of over 90 service centers, thousands of service employees, and an extensive logistics network. Metso is listed on the NASDAQ OMX Helsinki, Finland. In 2014, Metso's net sales totaled EUR 3.7 billion. Metso employs approximately 14,000 industry experts in more than 50 countries. Expect results.